The LG G5 is the successor to the very successful LG G4. What’s different? A lot. The LG G5 features an aluminum case and this makes the phone a lot more rugged than most other smartphones. The power button is built into the fingerprint sensor on the back of the phone. That’s a lot different from most other phones that typically put the fingerprint sensor on the front of the phone, not to mention the power isn’t normally integrated within this area. The most unique feature of the phone is that the bottom has a removable panel which allows insertion of a replacement battery very easily. I guess there’s more than one way to improve battery life, although this isn’t what I am thinking when I ask for better battery life. While the LG G5 is large, believe it or not, the screen size is smaller than the LG G4. Usually I’m seeing phone manufacturers take their phones in the opposite direction with larger screens. Still a big diagonal screen at 5.3 inches, this phone is 5.88 x 2.91 x 0.29 inches (149.4 x 73.9 x 7.3 mm). These are important measurements to keep in mind when selecting your mount. I haven’t seen any LG G5 custom cradles so we are going to discuss universal mounts. As already stated, the LG G5 is a large phone, even more so if you have a case or skin so you can’t just buy any universal mount. You need a mount with a large expandable cradle. If you already have a car mount for your old smartphone, you may need to upgrade the cradle to a larger one. Be sure to measure your phone before cradle shopping and remember, if you have a case or skin, the dimensions are even larger. As I often suggest for expensive smartphones, buy a case for it. I have always liked the Otterbox Defender series which we reviewed here, and there are other good cases from companies like Spigen. A single drop on ceramic tile that results in a broken lens will cost way more than the case. If you think insurance will cover you, think again. Insurance policies purchased from your carrier have a deductible and for newer more expensive phones that can be $169 on up. So to add insult to injury, you will not only be paying the monthly insurance premium, but you will then pay the deductible. You can read our article on phone insurance here. Get a case. OK, now on to the mount discussion. For the car, give the location of your mount some thought. There are lots of places to mount your LG G5. The windshield is the most popular location to mount especially if you plan to use it as a GPS. I love Waze for this purpose and it should work real well on the big LG G5 screen. 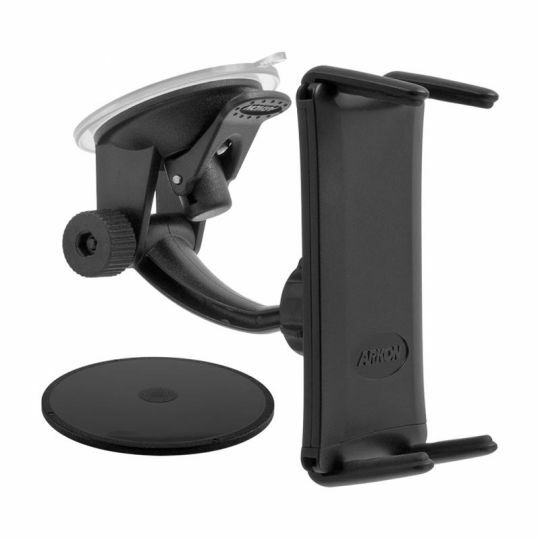 A well made expandable mount is the Arkon Slim Grip Ultra Travel Mount. This mount features an expandable cradle which expands to over 7 inches using a spring-loaded top and bottom. The support arms move so that you can expose any ports or buttons. This will fit your phone with or without a thick case. The mount comes with an adhesive dash plate so that you can attach to the mount to your dash as well as your windshield. The phone can swivel into landscape or portrait mode although I find that I typically use this mount in landscape 90% of the time. This is the mount found in the photo that accompanies this article. For a different mounting location, consider one of the dozen cup holders in your car. Consider the iKross Cup Holder Mount for Tablets and Phones. These mounts serve a dual purpose in that a cradle for a phone and a tablet are included. The mount is adjustable and solidly made to easily handle the weight of your tablet. You will see a lot of mounts on the market for tablets or cell phones. This is the only car mount kit known of that offers two different cradles, one for the phone, the other for the tablet. You will not find a universal cradle that fits phones and large tablets. The phone cradle will hold devices from 2 to 3.7 inches so no problem holding the LG G5. Another good location for your phone is the car air vent. Consider the Square Jellyfish Jelly-Grip Car Air Vent Mount. The Square Jellyfish Jelly-Grip mount can be used to hold most phone models with or without a case or skin. It has a ball and socket so the cradle so has the capability to be oriented downwards towards the driver versus the roof. This mount will work on flat vent slats that are 3/8 to 1 inch deep. The included cradle opens to 3 5/8 inches which is wide enough for the LG G5. For motorcycle use, it’s important that you select a mount that has a well constructed cradle that is going to hold your LG G5 tightly so that it stays secure in high vibration environments. We like the RAM X-Grip line a lot. These are heavy duty mounts that are mostly constructed of metal. The mount has gone through some rigorous shake tests and holds up well on a motorcycle. Most motorcycles can use the RAM X-Grip IV Handlebar Mount. These mounts feature the expandable X-Grip IV cradle which can open to 4.5 inches which is large enough for most cases. We always recommend tethering your device for added security.